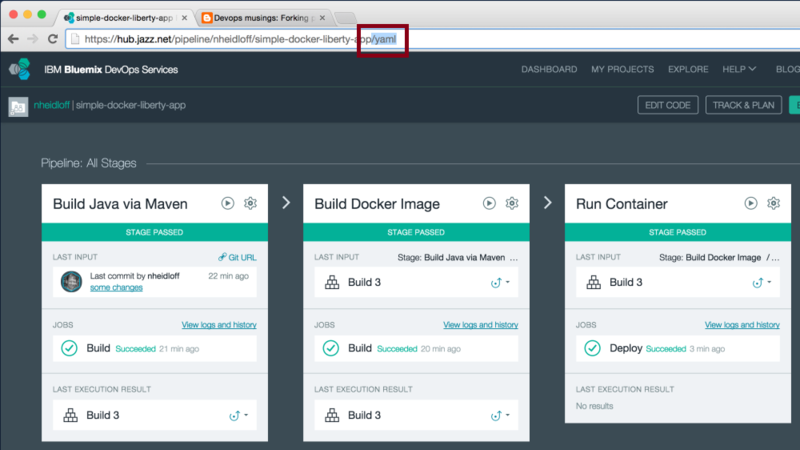 With DevOps pipelines in IBM Bluemix developers can define how to build and deploy their applications, for example applications packaged via Docker. Pipelines can be created manually via the Bluemix web experience and they can be shared as part of the application source code. This capability is imported when, for example, you want to allow other people to fork your project and deploy it directly to Bluemix via the Bluemix Deploy Button. The documentation describes how to generate a file that includes the pipeline definition. This file needs to be named “pipeline.yml” and put in the directory “.bluemix”. The screenshot below shows how to generate that file. At this point the mechanism might not be the most intuitive one. You have to append “/yaml” to your URL “hub.jazz.net/pipeline/owner/project_name/yaml”.